The curb gutter guard is one of the fastest and easiest ways to protect your inlet from unwanted silt, debris, and sediment. Constructed entirely from recycled materials, guards are designed for immediate placement in front of curb drains and gutters. Simply pick up the curb guard log and put it into place to stop debris, sediment, and other particles from entering the drain. If you have questions about storm drain inlet protection products, please don't hesitate to call us at 1-772-646-0597 or request a price quote. Typical Lengths: 8" to 12"
Questions about a storm drain guard? Please don't hesitate to call us at 1-772-646-0597 or request a price quote. If you're looking for storm drain inlet protection products that can be quickly installed by one person, is nearly invisible to traffic, and is street sweeper friendly, we recommend the Taurus Curb Inlet Filter. 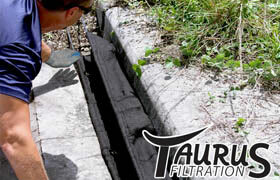 Taurus products present significant cost savings due to their extremely long lasting filtering capabilites. With regular maintenance, Taurus curb inlet guards have been used in the field 6-12 months and even longer! Curb guard protection is essential for any construction site, project, or work area looking to control the quality of water as it flows into the drain. Any time you need to remove sediment, heavy metals or hydrocarbons, drain protection is required to prevent contamination to the water system. Questions about storm drain blockers? Please don't hesitate to call us at 1-772-646-0597 or request a price quote.